Considerable effort is often practiced to blend or mix several different species of powders (of various sizes, shapes and densities) in order to have a homogeneous mixture of the intermediate or final product. Nevertheless, a well-mixed system may segregate during transport e.g. when discharging into a bin or big-bag, transportation in a truck or pipe-line, but this could also occur when loading the powder in e.g. a tablet press for production of pharmaceutical tablets. Prediction and quantification of this segregation phenomenon can be executed in our laboratory. The fluidization segregation tendency of powders can be assessed in accordance with ASTM D 6941 standard. In this segregation test, a fixed volume of a representative powder sample is fluidized and collected in different fractions. 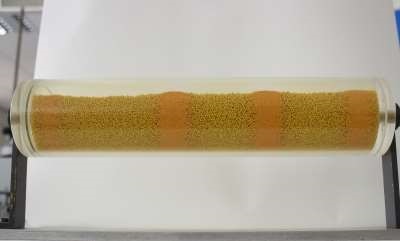 Subsequently, the particle size distribution and density is determined in the top and bottom fraction to quantify the segregation tendency of the sample. The sifting segregation tendency of powders is assessed in accordance with the ASTM D 6940 standard. A representative sample of a bulk solid is placed in the upper hopper and discharged to form a heap within the lower hopper, allowing segregation to take place. The segregated powder is discharged in a funnel flow pattern intended to recover zones of segregated powder. Specimens are collected from the discharge stream and sub-divided by a rotary riffler to be tested relevant to the application. These experimental approaches improve the understanding of how transportation and handling efforts can induce segregation of powders.